The pastel florals on this dress are so pretty. We love the feminine details of the drop peplum waist and the off the shoulder ties. As the weather warms, it's fun to add pom poms and tassels to everything! This keychain is adorable to add to any bag. 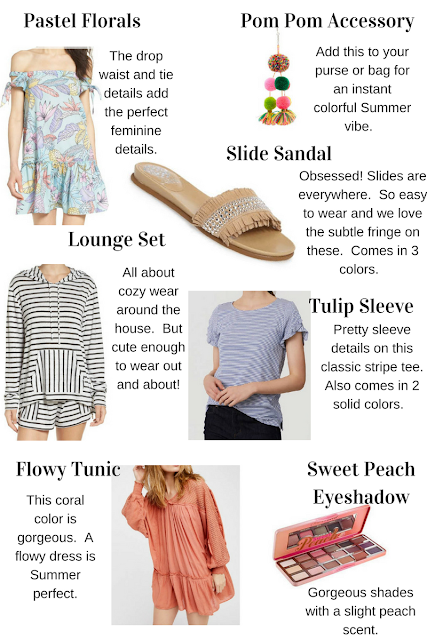 Slide on sandals are so popular right now and we think they are adorable with all the Spring tops and dresses. This pair has some fun fringe and come in 3 colors. We all love our down time, but still want to look cute. This lounge set is adorable! It also comes in a blue stripe. A basic tee, but with the cutest ruffle sleeves. I already bought this and love it. It's a supersoft tee! I have it in a size medium for reference. I wanted it to fit loose. Of course, we love this tunic. It flows and is just gorgeous. It comes in a few other colors, but we love this orange color for Spring and Summer. It'll be gorgeous with a tan! I have this palette and love it. The peachy colors are just gorgeous! And it smells like peaches! The colors are vibrant and last all day.